City of Chicago announces new public art in all 50 wards as part of the "Year of Public Art"
The Chicago Department of Cultural Affairs and Special Events (DCASE) invites dancers of all levels to flock to Millennium Park for the SummerDance Celebration on Saturday, August 26. The festival will feature a full day of dance competitions, social dancing, lessons and performances by local dance companies throughout the park from noon until 9:30 p.m. Admission is free. For a complete schedule, visit chicagosummerdance.org. Leading up to the SummerDance Celebration on August 26 and in conjunction with the Chicago SummerDance series, the Department of Cultural Affairs and Special Events (DCASE) will debut the SummerDance-Off competition. Residents are invited to show off their footwork and steppin’ skills at a series of city-wide amateur contests on July 8, 15, 22 and 29 at Chicago Park District locations as part of the SummerDance in the Parks program. The winners of each local contest will then compete at the Dance-Off finale at the SummerDance Celebration in Millennium Park at Cloud Gate on August 26. The new dance festival also brings a full day of dance competitions, social dancing and performances from noon to 9:30 p.m. Additional highlights include a DJ Dance Party at Cloud Gate, Circle Dance Lessons on the Great Lawn, professional dance performances at the Jay Pritzker Pavilion and much more. In addition to the nine traditional SummerDance in the Parks programs, DCASE has created four SummerDance-Off competitions that will be hosted by the Chicago Park District. Two competitions will feature footwork, a genre of street dance and related music that originated in Chicago, and two competitions will feature steppin’, a traditional African American dance form born in Chicago. The footwork events are produced in collaboration with Donda’s House, a nonprofit supporting young and aspiring artists in Chicago. Online registration for the Dance-Off competitions in the parks will go live on Saturday, July 1 at chicagosummerdance.org. Groups are encouraged to register in advance. On-site registration will be available at each location. Registration is on a first-come first-serve basis. In collaboration with Audience Architects and SeeChicagoDance, a dance service organization whose mission is to build and engage dance audiences in Chicago and advocate for Chicago dance, the Dance Village will highlight various dance companies, studios and advocacy groups including Ballet Chicago, RE|Dance, MADD Rhythms, Meher Dance Company and more with expo and performance areas. For a complete schedule, visit chicagosummerdance.org. Finalists from the steppin’ and footwork neighborhood competitions will battle on the dance floor. The winners will perform at Millennium Park’s Jay Pritzker Pavilion as part of the Mainstage Show later that evening. The steppin’ competition begins at noon until1:30 p.m., followed by the footwork competition at 1:30 p.m.until 3 p.m. This circle dance lesson, led and DJed by Paul Collins on the Great Lawn of the Jay Pritzker Pavilion, will encompass Central and Eastern European folk dances and will be a family-friendly, all-ages experience. The Most Versatile Dancer Contest® is an all-style dance competition with May I Have This Dance. This is an amateur dance contest where couples must prove that they know the most dance styles by dancing whatever the emcee announces for 20 to 30 seconds song clips. To stay alive they should be able to dance at least 3 basic steps, the correct timing, and clear knowledge of each dance. The winners will be selected after the last couple(s) are tapped out and/or have the most cards left. For complete details visit the website. Five professional local dance companies have been commissioned to make new works for this event. Featured companies, all making their Jay Pritzker Pavilion stage debut are Chicago Dance Crash, Red Clay Dance, The ERA, Brave Soul Movement and Move Me Soul. The evening will also include spotlight dances by the two winners of the SummerDance-Off competitions. After the show, the audience will be led back out to the Cloud Gate Stage where house DJ Kenny Ray will spin music alongside voguers and other local dancers, while attendees dance in front of Cloud Gate. In an effort to spread dancing throughout the city, SummerDance Chicago is the city’s premier dance festival, bringing communities together in a unique, urban dance space all summer long. Chicagoans can take part in dancing and live music every Friday-Sunday, June 23-September 10, in the Spirit of Music Garden in Grant Park and on Thursdays and Saturdays, July 13-September 14 in neighborhood parks throughout the city. For more information about SummerDance, visit chicagosummerdance.org and for details about Night Out in the Parks initiative, visit nightoutintheparks.com. As part of Chicago SummerDance and Year of Public Art, the Department of Cultural Affairs and Special Events and the Chicago Park District will present DANCE ZONES in six park district locations, July – August with a distinctive work of public art. The DANCE ZONES around the public art will be reserved by Park Supervisors and security as safe spaces to practice dance routines leading up to the four SummerDance-Off competitions during the month of July. Additionally, dance groups and individual dancers are encouraged to submit YouTube videos using the appropriate hashtags and handle tag-ins for a video competition. Hashtags and handles for tagging in posts are: #ChicagoSummerDance, #2017isYOPA, @ChicagoParks. For details visit chicagosummerdance.org. Jackson Park - 6401 S. Stony Island Ave. The Chicago SummerDance Celebration in Millennium Park is supported by the Chicago Transit Authority. For complete details on all Chicago SummerDance Events, visit chicagosummerdance.org or call the Department of Cultural Affairs and Special Events at 312.744.3316. Stitched is an exhibition focusing on artwork that makes use of embroidery and stitching techniques. The group show is in two parts, the first part opened Friday, March 24th and the second opens Friday, June 23rd. Embroidery, stitching, and other fibers techniques that fall under the category of "craft" have sometimes been viewed as separate or lesser than "fine art" in the arts community as a whole. This is in large part because these techniques and skills are historically associated with women and "domestic tasks", overlooking the intense skill and creativity required to create the artwork. It has been exciting seeing opinions drastically shift about craft —a category many of our artists fall under at the gallery year-round — in recent years. We are thrilled to be highlighting this specific medium and the artists behind it, both female-identifying and not, at Paradigm. Leading up to and throughout the exhibitions, HAHA Magazine will be featuring each artist, and more about their processes and thoughts behind their work. Artist names above will become clickable one by one as the interviews are published. We are thrilled for you all to dive into our biggest feature yet on a specific medium with us! Please contact sara@paradigm-gallery.com if you would like to receive the digital collector preview for this exhibition. David Rockefeller's New York Home Is For Sale! The 1920's Manhattan townhouse where David Rockefeller lived since 1948 is for sale and featured this week at TopTenRealEstateDeals.com. The Rockefeller dynasty has been one of America’s wealthiest and most powerful families for over 140 years. Similar to the Kennedys, Vanderbilts and Du Ponts, the Rockefellers are old money, influential in the country’s politics and business and deep pockets for charity. The Rockefeller legacy began with brothers John D. and William, who were co-founders of Standard Oil. David Rockefeller was the youngest and last of the six children of John D. Rockefeller, Jr. and grandson of the oil magnate John D. Rockefeller when he died in March at age 101 - worth over $3 billion at the time of his death. He was the chairman and CEO of Chase Manhattan, owned large real estate holdings and an important art collection that will be auctioned next spring. His wife of 55 years, Peggy, died in 1996. Over their lifetime, David and Peggy gave an estimated $900 million to charity. In his will, the bulk of David’s estate went to charity after the family trusts were divided between his five surviving children. Though most properties were donated to historic land preservation trusts or land conservation, several properties were offered first to his children who were welcome to buy them at fair market price. The proceeds would then be added to his charity funds. These properties were the East 65th Street Manhattan townhouse where the couple raised their children along with two properties in Maine and one in Columbia County, New York. If the children passed on the properties they would be placed on the open market. Such is the case with the Manhattan townhouse that David owned for almost 70 years. Constructed in 1924 for New York financier, railroad and real estate tycoon Adrian Iselin, the Rockefellers purchased the Georgian-style townhouse on East 65th Street in 1948. With four levels spanning its 40-foot-wide property, the mansion encompasses 9,777 square feet of living space with a basement adding an additional 2,465 square feet. The garden area is planted in mature silver birch trees and shrubs with a moss and brick-paved terrace providing lush green views from inside the home. Arched windows, ornamental cast-iron entry gates and window guards along with the reddish brick exterior add a stately and welcoming entrance to the mansion. In the 1970s, society architect Mott Schmidt redesigned the interior in keeping with the Georgian style. He created a well-proportioned layout, large rooms with tall ceilings and windows for entertaining and more intimate rooms for the family. There are eight bedrooms and eleven baths, formal dining and living, a sitting room with garden access, library, eight fireplaces and a large wine vault. In addition to the circular stairway with red carpeting that ascends to the top level with a skylight at the pinnacle, there are six staff rooms and an elevator. Listing agents are Mary Rutherfurd, Paula Del Nunzio and Leslie Coleman of Brown Harris Stevens in New York City; priced at $32.5 million. Jim James, Jack Johnson & D.A. 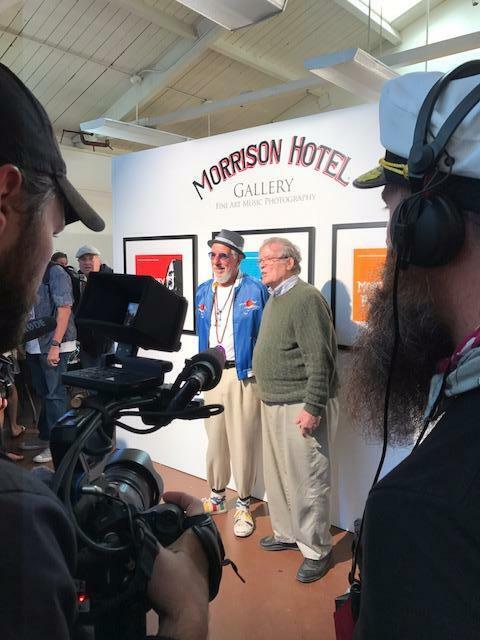 Pennebaker Gathered at Morrison Hotel Gallery at the Monterey Pop 50th Anniversary Celebration! On June 18th, 1967, The Who took the stage at The Monterey Pop Festival. As Pete Townshend was smashing his guitar on stage, a young photographer from Laurel Canyon named Henry Diltz was standing on the side of the stage, watching history being made and capturing it on film as one of the official photographers for the festival. Music and history came full circle on June 16th, 17th and 18th, 50 years later on the exact spot of the original festival. On site and the official gallery of Monterey Pop was Morrison Hotel Gallery, the fine art photography gallery co-founded and co-owned by iconic photographer, Henry Diltz - who was there on site at the celebration to take pictures of the performances, meet fans and sign autographs. 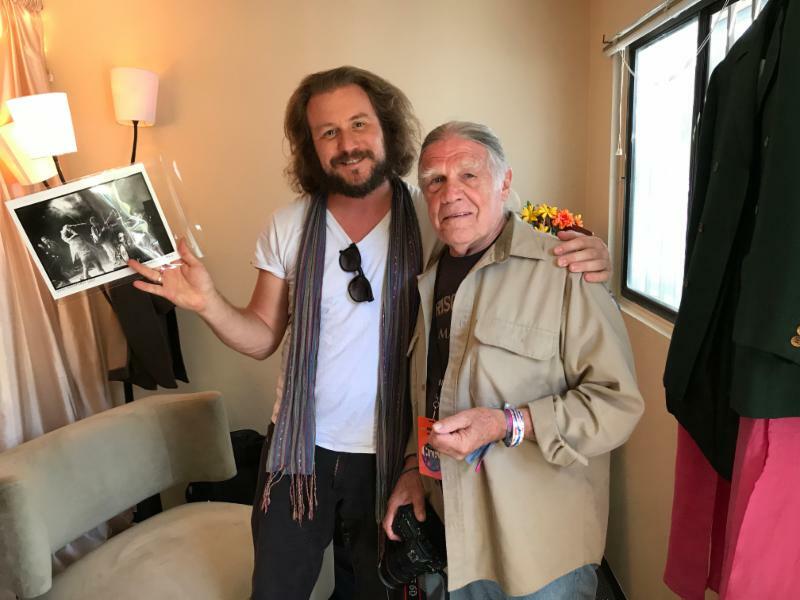 Henry Diltz gifted a signed print of The Who on stage at the original festival to Jim James (My Morning Jacket) who payed tribute to the band on stage during the festival celebration. Also on site at the PopUp gallery was legendary filmmaker D.A. Pennebaker. Accompanied by his two sons and grandson, the man who made the Monterey Pop documentary is now the subject of a documentary his family is making of him, at the festival, 50 years later. 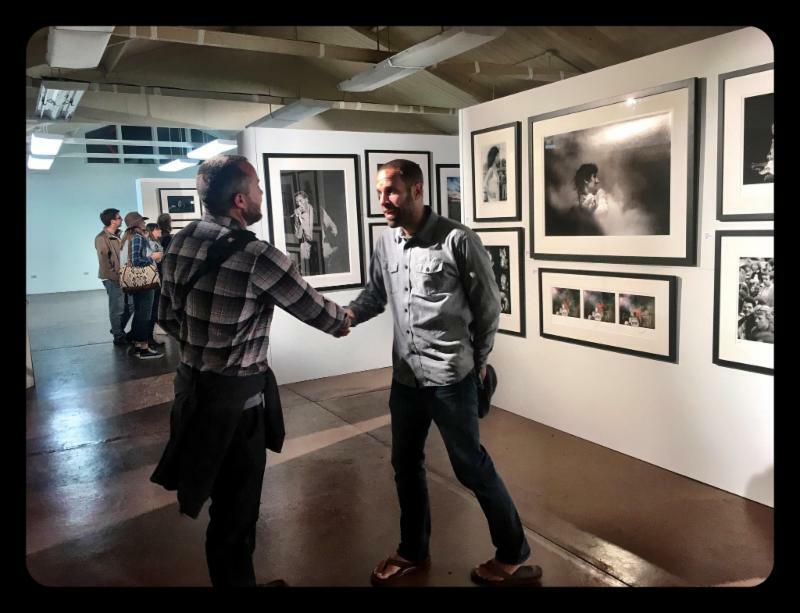 The Morrison Hotel Gallery PopUp gallery was the gathering place at the festival, for the legends of the past and the present. Festival creator Lou Adler and D.A. Pennebaker and his family were there. Iconic producer and manager of the Rolling Stones, Andrew Loog Oldham and singer Jack Johnson were on site at the gallery, as well as photographers Elaine Mayes, Jerry de Wilde, Danny Clinch and Jay Blakesberg, who is new addition to Morrison Hotel Gallery. It was history in the making all over again. The Chicago Artists Coalition is pleased to present Stay alive, a solo exhibition of new sculptures by BOLT Resident, Jeffrey Michael Austin. Arrayed in a deliberate configuration throughout the center of the space, carefully tended plants dare us to question whether they belong. This space is for them, we see. An assiduous steward has furnished light, water, and humidity to address their needs; such is their authority that it feels likely we've wandered in on accident. An initial take on the ostensible "grow operation" commandeering the Chicago Artists Coalition's project space asks, "What else can an exhibition venue be?" A startling alternate to the way a space devoted to the exhibition of art is typically leveraged, Jeffrey Michael Austin's installation signals a moral dimension-- one that appears to reject art's alignment with luxury commodity and embrace instead a utilitarian, even survivalist functionality. Stay alive reveals the artistic voice as subsumed to the survivalist imperative: functionality complicated by sly evidence of the artist's touch. Drawings and words in condensation on mirrors, typically momentary and futile, become permanent through Austin's deft material manipulation. 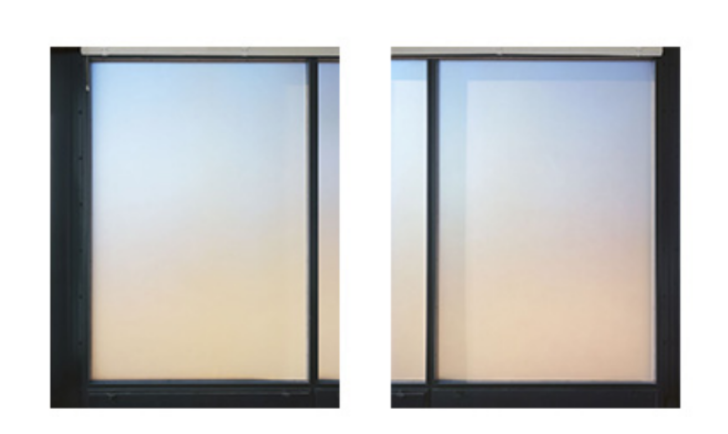 Regarding ourselves in the misted mirrors, furnished for the amplification of both light and self, in what state do we capture our own reflected images? Hilariously, alarmingly: which do we concern ourselves with more? The Chicago Artists Coalition is pleased to present Of Memories and Forgetfulness, a HATCH Projects exhibition featuring artists Caroline Liu, Pooja Pittie, and Brittney Leeanne Williams. The ability to remember and forget performs an important role in our lives and is linked to the questions we ask ourselves. According to postcolonial theorist, Françoise Verges, "the mechanism of forgetfulness has ramifications far beyond the importance it has played in psychoanalysis." She goes on to quote Sigmund Freud in noting that "forgetfulness is not left to psychic arbitrariness, but that it follows lawful and rational paths." Memory, on the other hand, remains in constant flux, susceptible to the analysis of remembering and forgetting, unaware of its successive distortions, vulnerable to manipulation, predisposed to being long dormant and periodically revivied. Remembering and forgetting almost always occur in tandem. In Of Memories and Forgetfulness, the artists' reclamation of memory, evident in their work, functions as a counter-hegemonic act asserting their agency and subjectivity. Through explorations of identity and personal narrative these artists use memory as a tool of recognition. Utilizing the almost ritualistic form of recalling, this act of remembering solidifies and grounds each artist firmly in the present. Brittney Leanne Williams' work explores remembered narratives of race, invisibility, and state-sponsored violence. Pooja Pittie's abstract paintings recall her ability to move freely while confronting her progressive muscle disability. Caroline Liu's work tackles her short-term memory loss while grappling with feelings of vulnerability. Of Memories and Forgetfulness is curated by Sheridan Tucker. For more information about the artists, curator, and exhibition, please click HERE. Image: Brittney Leeanne Williams, Fray 2, 2016, Acrylic on Paper, 49 x 56 in. America corporations and private institutions have a long history of collecting art, but often keep it hidden behind closed doors. In this unique opportunity, U.S. Trust welcomes the Chartwell Collectors Circle to a private tour of Bank of America's Chicago art collection. Art historian, curator, and writer Kate Pollasch will lead us through the Bank's collection of Post-War and Contemporary Art to discuss it's Chicago histroy, with works by artists such as Michiko Itatani, Gladys Nilsson, Jim Nutt, and Ray Yoshida. Delve into how and why corporations collect, and explore the grandeur of the Field Building where department store owner Marshall Field once lived, now the home of U.S. Trust. Save the Date! The Chicago Artists Coalition is pleased to announce this year's special exhibition will be extended to three weeks, opening on September 8 and closing on September 28, 2017. The CAC is also delighted to announce that artist, writer, and publisher, Caroline Picard will curate this year's exhibition, titled "The Distance Between Two Points." The ANNUAL is a yearly sales exhibition celebrating cutting-edge Chicago-based artists. Arranged by a guest curator, The ANNUAL creates an accessible forum for emerging collectors to discover affordable new work and engage directly with its creators. Image: Assaf Evron, Untitled (S.R. Crown), 2016, archival inkjet print, 40 x 40"
Spike TV’s “Bar Rescue” returns with all new episodes featuring bar owners across the US looking for one more chance at success. The fifth season continues as Jon Taffer attempts to resurrect closed neighborhood bar Casual Tap in Chicago, IL by reigniting the passion of the burnt out firefighter who owns it. For a sneak peek of this episode, click HERE and for a sneak peek of the upcoming season, click HERE. “Bar Rescue” will feature additional bars in Las Vegas, NV, Los Angeles, CA, and Chicago, IL throughout the rest of the season. “Bar Rescue” returns Sunday, July 2 at 10:00 PM, ET/PT as the fifth season continues with world-renowned bar and nightlife expert Jon Taffer giving failing establishments one last shot at success. From 3 Ball Entertainment, Spike TV’s popular original series follows Taffer as he wields his three decades of experience in the restaurant, bar and nightclub business to help give failing bars nationwide one last chance to transform themselves into profitable businesses. This season, Taffer has already rescued bars in Las Vegas, Palm Springs, Seattle, San Francisco, Denver, Chicago, Los Angeles and New Orleans.